Would you like to know how to drag and drop stop loss and take profit levels in MetaTrader 4 (MT4)? In the past, you needed to use EAs to do this, but today, you can simply use the built-in drag-n-drop features of MT4. Metaquotes (creators of MT4) have also added a built-in script to create custom time frames in MT4. However, the script has to be re-applied to your charts every time you restart MT4, so I’ve written an article about how to permanently create custom time frames in MT4. As much as the community has begged for them, we still don’t have tick charts as a built-in feature of MT4. Luckily, our helpful community of coders have found ways around this limitation. I’ve written an article on how to create tick charts in MT4 as well. Although we’re still waiting for the addition of certain features, the built-in drag-n-drop feature in MT4 is perfect. In this article, I’m going to show you how to drag and drop your stop loss and take profit levels in MT4. I’ll also show you a simple setting that I use to make this feature more practical and useful. The first thing you need to do in order to drag and drop your stop loss and take profit levels in MT4 is make sure that your levels are showing up on your charts. In MT4, go to your Options (Ctrl+O or Tools > Options). Under the “Charts” tab, make sure “Show trade levels” is checked (see the image below). At this point, you may also want to check “Use ‘Alt’ key to drag trade levels” as well (see the image above). If you don’t check this box, you could accidentally move your stop loss or take profit levels when you are trying to move other objects on your chart, such as trend lines or horizontal support and resistance levels. You also need to make sure that you’re using a color for your trade levels that is visible against the background of your chart. Go to your chart Properties (F8, Charts > Properties, or Right-click > Properties). Under the “Colors” tab, make sure that your “Stop levels” color is visible against your chart background (see the image below). Note: Make sure to re-save your template after making any changes to your chart Properties. Now you’re ready to drag and drop your stop loss and take profit levels in MT4! Doing so easy. 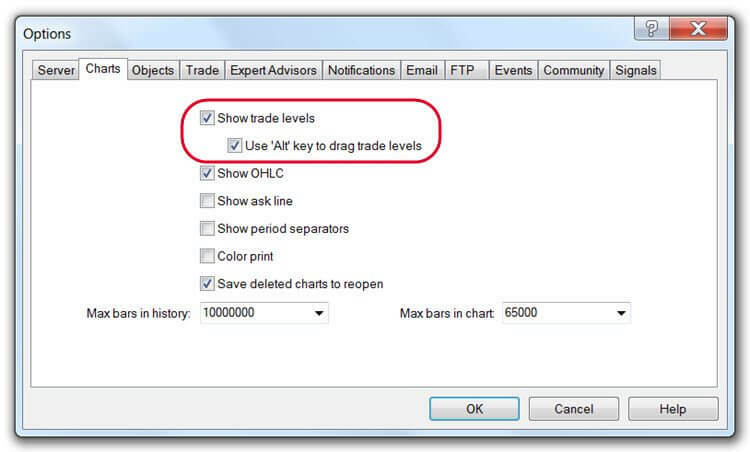 If you checked “Use ‘Alt’ key to drag trade levels” from the step above, simply hold the “Alt” key while hovering your cursor over your trade level. Click, drag, and release to reposition your level. If you haven’t already manually entered your stop loss and take profit levels, you can also use this feature to create them on-the-fly. Simply hold the “Alt” key, click on your entry level, and drag to create your stop loss or take profit level. Repeat to create your remaining trade level (see the video above for more detail). It appears that Metaquotes actually listens to its users. They’ve added added several features that we asked for, although we’re still waiting on a few features that are common among premium trading platforms. The ability to drag and drop stop loss and take profit levels in MT4 is a nice addition. What feature would you like to see in MT4? Leave a comment below. Why would you want to use a TP at all if you’re using a trailing stop? I’ve never used this EA in the way you’re describing, so I wouldn’t be able to tell you. I use this EA to drag and drop TP and SL levels, to scale out of positions (with certain trading strategies), and to automatically move my stop loss to break even (and sometimes lock in some pips) after price moves a certain amount in my favor. I recommend downloading the EA, and testing the different features on a demo account. You’ll just have to experiment with it. Chris, any clue how to use the EA’s Auto SL/TP using ATR? What do the ratios mean? I never use that feature. I use this EA for the drag-n-drop and break even features. There is a manual for this EA. Google “quik trailing ea manual.” I’ll try to upload it to this page, if I can find it again. Also, do you think the EA can still work if it is added to the chart only after I open a position? And what happens to the Breakeven/Trailing levels when I manually modify the SL/TP lines? Would one action cancels the other? Would the open positions be updated on modifications on the EA after the open positions are executed? Yes. You can add this add this EA at any time. Also, one action should cancel the other. I believe I tested that out when I first started using this EA, but it’s been a while. I always drag the SL/TP lines when I add this now. Feel free to correct me, if that’s not the case. Will this change once I enter a trade? I guess so. When I use this, I typically add it to the chart of my already open trade. I don’t think I’ve ever gotten that message. Please let us know if that’s the case, Freddie. Chris… I would say that either English is not your first language and you need to revise more or else you’re an idiot! Just my perspective thats all. Hi chris, I have been using the quik trailng ea for some time now Just recently since changing to the latest mt4 with one click trading i can no longer drag and drop the stop loss lines.When i double click the line the mt4 order box appears.I ve tried placing the stop loss order in the box but when i get out of the box the stop loss go back to the auto s/l.I also can not change the values in the auto s/l. When i change the values and set to true it does not change on chart. Any help would be appreciated. I don’t have any live trading experience with one-click-trading versions of MT4. Just some limited demo trading experience, in which I did not use this EA, as far as I can remember. I can tell you, however, that the auto S/L and T/P levels have to be set *BEFORE opening a trade (with the EA added to your chart and activated) in order for the auto S/L and T/P levels to execute. In other words, if you try to edit these values after a trade is opened, the changes will not update on your chart immediately; but the EA should execute your new values on the next trade. I wish I could be more helpful than that. Let us know if you get it figured out. Drag the SL or TP line a little bit. A yellow line will appear where the line was, quickly double-click the new line. A little box square appears at the end. Now you can drag it and place it where you want. The original line will follow and become one. Update: My new 100-Trade Test Demo account uses a one-click-trading EA. I’ve had problems too, but I figured it out. Just click the button to TURN OFF your Expert Advisors while you make your adjustments. Then turn them back on again. That works 100% for me. by an indicator, or do you have to manually insert them? Thanks for the kind words, James! In the input settings, you can change it to have automatic TP and SL numbers if you like. You can also add them manually. This EA is great Chris, thanks. I’m not the author of the EA, but I’m glad you found it useful. I can’t find an mq4 file for it anywhere. I did find a manual for this EA, though. Note: I added the manual to this EA. I just entered a trade and my computer restarted and the SL and TP lines are gone…. Will dragging the SL and TP from the navigator work correctly with the trade that is currently on? I had issues with those earlier. (I’ve used the SL and TP lines from immediate trade) the ones that get placed automatically, not new ones that I have to drag. You’ll probably have to reset them. If your SL and TP levels are showing up in Mt4, you may not have to, though. How do I reset them? Thanks. It is working now. Have you ran into issues of putting a pending order, and getting filled at market wherever you drop it? For example, I’m trying to SELL, however I want to SELL higher than current level, so I place it above, yet I get filled below….. it SEEMS as though you cannot place a SELL pending order if the price is below that order. Or a BUY pending order when the price is abobe the order, because it matters where you drop it. If it is below the price, then a SELL gets placed, and if you place the order above the current price, then a BUY order is placed. Do you know how to work around that? I think I had that happen to me when I first used it, but I usually added it to the chart after I entered my trade. It’s been a while since I’ve used this one though. Today I was on a trade with NZDUSD and my trade was closed way before the stop loss line. It is almost impossible to use MT4 when it is closing trades before they actually hit the STOP LOSS line. Also, I notice that it also rarely closes on the SELL TP line in MT4 too – though I am told this is not MT4 it is the fault of the broker – neither will take responsibility as the broker blames MT4. I have actually not received an honest explanation about this. I watch most of my trades and I can see it happen in real time. I was shocked this morning to see another trade CLOSED before it hit the actual SL line and sad to see it NOT close whenever it hits the SELL TP line. Any thoughts on how to fix this????? Sounds, to me, like your broker is adjusting the spread to take out your stops and keep you in plays that you should have already profited from. You have to adjust your levels, if you’re dealing with a time frame low enough that the spread becomes a factor. Some brokers will widen the spread just enough to take out your stops (if enough other traders also have stops there). They can also keep you in plays that should have profited this way, but I imagine that happens less often. It happens all the time. I think it’s a shady practice. I don’t like it. That would be my guess, though. Also, make sure you’re using MT4’s built-in drag and drop levels, like I suggest at the top of the article, if you don’t need the other features of this EA. thanks for the EA, was what i was looking for! Setting a hard stop when my broker won’t allow small stops is annoying. This EA solves the problem. Great website too, just stumbled on it. Have a LOT of reading to do now! Hey, Marty! Thanks for the kind words. I’ve used brokers that did the same thing, and I agree: it is annoying – especially if you trade the lower time frames. I’m glad you found this helpful. Thanks for the EA Chris. Have not used it yet but will. I am a new trader……do you have a broker you think is good in the USA? Hey, Bob! I would recommend FXCM. FXCM has been around for a while and is a trusted name. They also use the correct GMT +2 charts (NY close). In Metatrader, this means your week will consist of 5 daily candles. Many brokers don’t use the correct charts, and you end up having 6 daily candles. This is bad for price action trading on the daily chart and everything lower than a daily chart. One thing you can do, though, although it’s a hassle, is to use a demo with NY close charts, like FXCM, FXOpen, etc… (find more unlimited MT4 demo accounts), to analyse your market and make trading decisions, and just use your actual broker to place the order. A third and much more expensive option is to invest in a charting service like eSignal or get TradeStation or Ninja Trader with a premium signal service. I still use MT4, and I can tell you that all the fancy trading software in the world won’t make you successful if you don’t already know what you’re doing. Good luck! Hi Chris. Great website. Many thanks. The Quik EA is something I have been looking for. The only modification I would love to see is for the SL to move to the trailing step level when the trailing stop starts. For example. say SL is at -5 pips and Trailing Stop (TS) is set to start at +15 pips with a trailing step of 1. At the point the TS kicks in I would actually like the SL level to move to +14 i.e. the start of the TS level less the trailing step. The logic for this is that generally I take profits at 15 pips but if I had the above facility I might be able to squeeze some extra pips if the price action was particularly strong at that point. I understand, but I thought that was already possible. Maybe I’m wrong. I never used it that way, but I thought you could start your trailing stop as close to price as you wanted. Either way, I didn’t create this EA or any other EA or indicator on this site. I didn’t have it made either. I picked this up on another forum (not sure which one), but there are some other places on the web where you might find some help with this. If all else fails, you could pay to have it outsourced at Elance or something similar. Good luck! I’d like to see the ability to scale out of a position, to close part of a trade in profit and let the remainder continue. When you set your stop loss and tp it shows in pips, but it’s really in pipettes (Points). Why does it do it this way? Why does it say pips, when in fact it’s not! It just grinds my gears that it’s so misleading. Is there a reason for this? Thanks for your explanation on how to set the stop loss and take profit using the chart. Very easy to follow. Thanks for reading. I’m glad you found this tutorial useful. Whether or not your charts shows pips or pipettes is determined by your broker. I’ve used brokers (when I first started trading) that used a version of MT4 that showed actual pips when measuring. So if I put my stop loss 20 away, that would actually be 20 pips. However, most brokers use an extra digit, so you’d have to use 200 to get 20 pips. You get used to it. It’s never really been an issue for me. I know there is a drag and drop feature in MT4 for adjusting the stop loss and take profit lines by moving them with the mouse up or down instead of entering the price for SP and TP. But if one enters two or more orders of the same pair right after the other and the prices match or differ by less than a pip (they are so close together), then dragging and dropping the SL and TP only occurs for one order and not the other orders because, I guess, MT4 can’t distinguish between the orders because the entry prices are the same or differ by less than a pip. If the prices between the orders differ , let’s say, 5 pips, than there is enough space between the orders so one can use the mouse and move SP and TP for each order. So, maybe you know a way to drag and drop SL and TP for multiple orders when the entry prices of those orders differ by less than a pip or a pip. Again, SL and TP can only be adjusted for one of those orders. How to adjust the SL and TP for all other orders? I hope you understand my question. If not, try experimenting yourself by entering many orders after another and their prices basically match and then try to adjust SL and TP for each order by moving your mouse from the entry price line up or down and see if it works. Thank you. I know what you’re saying, but I can’t help you. I haven’t used any strategies where I would enter the market with multiple orders (scaling in) except for with one account, years ago, where I tried some hedging strategies. However, I wasn’t using stop losses for those strategies.